Not to be confused with Jumeirah Islands. Developments in Dubai as of 2010 with Palm Jumeirah in the center. Palm Jumeirah Monorail is a 5.4-kilometre-long (3.4 mi) monorail connecting the Atlantis Hotel to the Gateway Towers at the foot of the island. The monorail connects the Palm Jumeirah to the mainland, with a planned further extension to the Red Line of the Dubai Metro. The line began operating on 30 April 2009. It is the first monorail in the Middle East. Construction of the Palm Jumeirah island began in June 2001 and the developers announced handover of the first residential units in 2006. In early October 2007, the Palm Jumeirah had already become the world's largest artificial island. Also at this time, 75% of the properties were ready to hand over, with 500 families already residing on the island. By the end of 2009, 28 hotels were opened on the Crescent. The complexities of the construction were blamed, in part, for the extended delays to the completion of the project, the date of which was pushed back multiple times and was nearly two years late. In 2009 The New York Times reported that NASA's laser altimeter satellites had measured the Palm as sinking at the rate of 5 mm (0.20 in) per year. In response Nakheel said they had received no reports of structural problems of a type that would be expected if there were any subsidence, and pointed out that the laser satellites had a measurement resolution of only 50 mm (2.0 in). After launching the project, it was revealed that Nakheel increased the number of residential units on the island (with a concomitant reduction in the amount of physical space between individual properties) from the originally announced 4,500 (comprising 2,000 villas purchased early in the expectation of greater separation between properties). This increase was attributed to Nakheel miscalculating the actual cost of construction and requiring the raising of additional capital, although Nakheel has never commented publicly on the matter. The New York Times reported in 2009 that many people had bought houses before they were built and are furious about the space available now and the way they seem to be living on top of each other. The outer breakwater was designed as a continuous barrier, but by preventing natural tidal movement, the seawater within the Palm became stagnant. The problem was corrected by adding another gap in the barrier. As explained in the National Geographic Channel's documentary Impossible Islands, part of its MegaStructures series, the breakwater was subsequently modified to create gaps on either side, allowing tidal movement to oxygenate the water within and prevent it stagnating, albeit less efficiently than would be the case if the breakwater did not exist. This same episode addressed the issue of marine life as well, but stated that the breakwater has actually encouraged marine life and that new marine species are moving into the area. ^ "Top 8 Engineering and Architectural Wonders of Dubai". 14 December 2016. ^ "Population In Dubai, UAE". ^ "Palm monorail tried and tested – The Knowledge News". TimeOutDubai.com. Retrieved 27 August 2010. 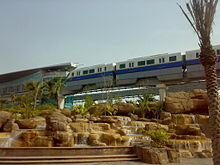 ^ "ME's 1st monorail to begin services in April". MENAFN.com. 8 August 2008. Archived from the original on 11 June 2011. Retrieved 11 August 2008. 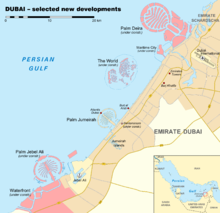 ^ a b c "Dubai's Palm and World Islands – progress update". AMEInfo. 4 October 2007. Archived from the original on 11 October 2007. Retrieved 28 October 2007. ^ "Nakheel: Palm Jumeirah is 'not sinking' - Real Estate". ArabianBusiness.com. Retrieved 15 January 2016. ^ ""Palm before a storm?" Daily Telegraph article by Catherine Moye, 20th August 2005". The Daily Telegraph. London. 20 August 2005. Retrieved 21 May 2010. ^ a b "Palm Island Dubai FAQ". ^ "MegaStructures – National Geographic Channel episode guide". ^ "Waldorf Astoria Palm Jumeirah set for January opening in Dubai". GulfNews.com. 27 December 2013. Retrieved 15 January 2016. Wikimedia Commons has media related to Palm Jumeirah.